Thursday, February 14, 10 a.m. — The series of storm systems that have pummeled California this week are causing flooding and mudslides in some of the Northern California counties that make up the American Red Cross’s Northern California Coastal Region (NCCR). In Marin County: A mudslide in the middle of the night caused a home in Sausalito to slide into a vacant home below it. One woman was rescued. About 50 homes are currently evacuated in the area as a precaution while officials determine the stability of the rest of the homes on the hill. Red Cross is operating the evacuation center at Sausalito Fire Station 1. Twenty-five to 30 residents are currently at the evacuation center. Red Cross volunteers are on site providing care and comfort to the residents awaiting word from officials. In Santa Clara County: The Weather Service issued a flood warning for the portion of the Guadalupe River in the middle of the City of San Jose at 2:30 a.m. Red Cross opened an evacuation center at Willow Glen Community Center at 3:30 a.m. An evacuation advisory was issued at 4:21 a.m. The evacuation advisory was lifted at 6:45 a.m. today. In total 20 people, three dogs, and three cats (managed by our partners) took refuge at our evacuation center. In Santa Cruz County: A large oak tree fell on a home in Boulder Creek this morning, displacing residents there; the home is also being deluged by water from intense rains in the Santa Cruz Mountains. The local Red Cross chapter’s Disaster Action Team has provided support (emergency lodging, food, and clothing) to a family of four (2 adults and 2 children). There were no injuries reported. Many thanks to the dozens of amazing Red Cross volunteers from our region who answered the call overnight and this morning to help those in need of shelter in the middle of this most recent storm. With winter storms affecting residents in California and elsewhere in the U.S., please take a few minutes to read this Red Cross story, which includes important tips on staying safe. See full-size photo and the incident photo album. A gas line explosion in San Francisco on Wednesday, February 6, resulted in a three-alarm fire and displaced residents and workers. The explosion occurred around 1 p.m. at the corner of Geary Blvd. and Parker Ave. in the city’s Jordan Park neighborhood; the ensuing fire was brought under control about three hour later. Six mixed-use commercial/residential buildings have been red- or yellow-tagged as a result of the incident. 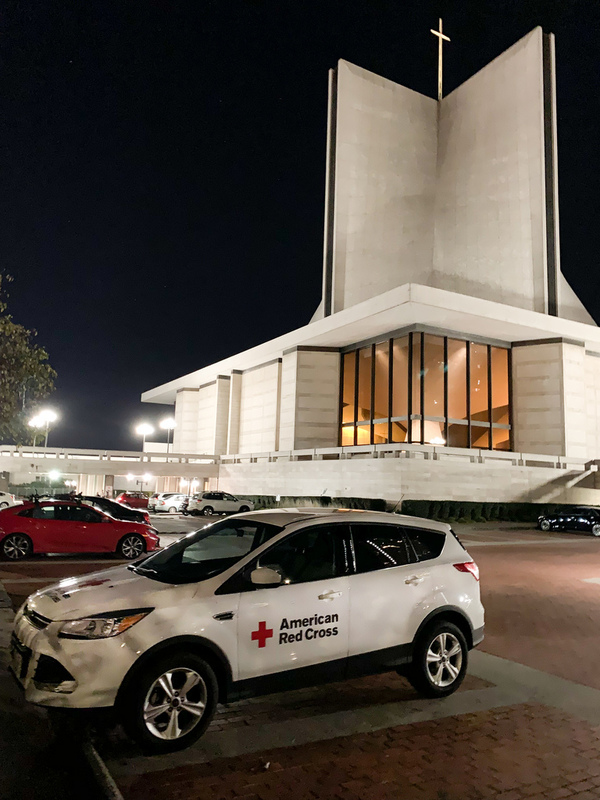 An evacuation center was opened at Saint Mary’s Cathedral at 1111 Gough St. for individuals in need of shelter or impacted by PG&E’s need to shut off power to the affected area. Red Cross volunteers also responded with an Emergency Response Vehicle to provide water and food to first responders and evacuated residents at Mel’s Diner. Two muni buses were requested as additional warm spaces for evacuees. Dinner was ordered for first responders and residents at the evacuation site and for the shelter. The volunteers have collected information at the evacuation site from six families whose residences were affected by the fire. All other impacted individuals or families have found their own lodging. Red Cross personnel closed the shelter today (Thursday, February 7) and are continuing with traditional casework and referrals to our partners. Residents displaced by the gas line explosion and fire may call 415-427-8010 to register for Red Cross assistance and referrals. All of us have been to the Holiday Party where you are asked to bring a “White Elephant” or modestly priced gift to exchange. When your number is called, you dread walking over to the pile of gifts and picking what you are sure will be something you would never buy for yourself and would more than likely end up at your local second-hand store. Dr. Charles Renner and his wife, Susan, of Concord decided to do something different this year. They had been following reports of the devastation of the Camp Fire. While neither they nor their families were personally affected, they felt a kinship with those who were. “I just imagined myself in their shoes,” Susanne said. Recognizing that those impacted by the fire needed flexible financial support, the Renners, their family, and extended friends pooled their resources and drove to the Silver Dollar Fairgrounds on Christmas Day. They hoped to be able to personally present their gifts along with a supportive hug to the people at the Silver Dollar complex, but quickly realized that this would be impossible because of the large number of people there. Their generous donation was given to the Red Cross, which in turn will be working with St. Vincent DePaul to ensure that Renner’s generosity will benefit those who needed the help. The Red Cross thanks Dr. and Mrs. Renner for their kindness and generosity. San Francisco has always had a special relationship with the US Navy. One example of that is San Francisco Fleet Week (SFFW), which began in 1981. The annual celebration of America’s sea services takes place over Italian Heritage Weekend in October on the Marina Green. Wars, ethnic cleansing, genocide, and poverty — having plagued humanity for centuries — sadly continue to be part of our heritage today. The terms are synonymous with death, destruction, and the displacement of millions. But in spite of everything, there is still HOPE, manifest in the work of a humanitarian organization that lights the way amid the darkness.